Now that he's played in his first MLB game, Kris Bryant rookie cards are on the way. Although he's had lots of minor league and prospect cards already, none have been part of a major league base set. 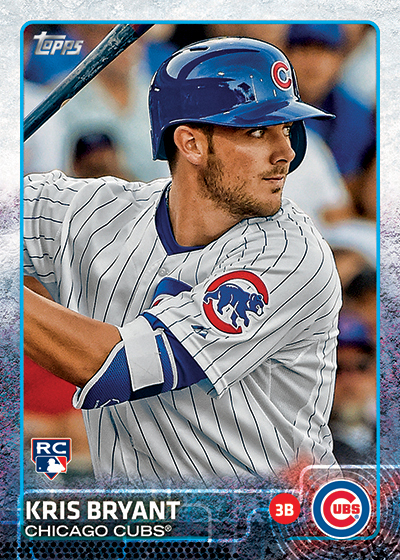 Topps has announced plans for including the Cubs rookie in several upcoming sets and all his rookies can be seen in our detailed Kris Bryant rookie card guide. His first official rookie card arrives in 2015 Topps Finest Baseball, which is scheduled for a June 3 release. He'll be #111 on the checklist and it will be a short print. He also has an autograph in the set. A couple more Kris Bryant rookie cards will follow later in the month in 2015 Topps Archives Baseball and 2015 Topps Series 2. The Archives rookie card also appears to be a short print. The retro-themed set will also have a limited number of autographs. While not rookie cards, 2015 Bowman Baseball, which releases April 29, has Kris Bryant on the Prospects insert checklist. 2015 Topps Tier One Baseball arrives on May 20 with autograph redemptions. Looking further on into the summer, even more Kris Bryant autographs are planned for 2015 Topps Stadium Club, 2015 Topps Allen & Ginter and 2015 Topps Chrome Baseball. Although it's not a rookie card, his 2014 Bowman Chrome Prospect Autograph and 2013 Bowman Chrome Draft Prospect Autograph (which came out in 2014 products) should continue to garner the most attention among collectors. In today's hobby, a player's first Chrome Autograph is often treated like rookie cards were back in the 1980s and 1990s. Bryant is regarded by many as baseball's top prospect right now. Despite leading the league in Spring Training home runs, the Cubs sent him back to the minors for a short stint, likely to keep him away from free agency for an extra year. Lot of Fifty (50) 2015 Topps #616 Kris Bryant ROOKIE VARIATION Cards all MINT ! Law of Cards: Who, If Anyone, Owns Checklists? Here comes the saturation train. Do you know if the 2015 Topps Series 2 Kris Bryant will be a short print a la Bryce Harper in 2012? David � Nothing has been announced either way. Wonder when/if Topps is going to roll out the Kris Bryant Tier One Autograph? Been waiting a good while for it, seems like ever product releases then within 5,6 weeks the Bryant auto is fulfilled and some have even been quicker. I was really surprised how quickly Topps sent out the Finest Bryant cards, but now it seems like they are slowing down a bit in the off-season. The Tier One is my last outstanding Kris Bryant auto from Topps, I can’t wait to get it. Lucked out and got a Bronze Ink /25 for the same price base autos were going for. Now I just need Topps to print the thing and get it signed.